Learn to make juicy baked pork chops every time with just a few simple steps. The perfect pork chops for kids. When you think of pork chops, what comes to mind? If it’s shoe leather or grandma’s house, this recipe will forever change your thinking. I used to avoid cooking pork chops like the plague because I didn’t know how to properly cook pork. Then I ended up with a freezer full of pork after purchasing some fresh meat from a farmer friend. I needed to figure out how to turn this pork into something edible. After some research, I felt prepared to give a baked pork chop recipe another shot. I brined, I seared, I baked. And wow, it paid off. My kids (who am I kidding, the hubby, too) were unsure the first time I re-made pork chops, it seems memories of shoe leather don’t fade fast. This time it only took one bite and they were sold. Why in the world do we need to do this, you might ask. Brining comes in handy for pork, a lean meat. Lean meats, such as shrimp, chicken, and pork are easily overcooked, and end up tough. Brining helps ensure a juicier end result. It’s a pretty simple concept, one that our kiddos may be learning about in school right now. Brining works by osmosis. By sitting in the salt water solution, the meat will absorb water in order to equalize the salt levels. The higher water content of the meat is a good thing because moisture is lost during the cooking process. In simple terms, by starting off with a higher water content, you end up with a higher water content, equating to juicier pork chops. Not only does the meat absorb water, but it also absorbs salt. Salt plays another role. It helps break down proteins in the meat. Have your kids gotten into the putty craze? Mine have. You can think of the chop starting as a piece of Crazy Aaron’s Thinking Putty. Right out of the tin it’s kind of hard. As it’s squeezed in their hands, it warms up and becomes malleable and workable. This is what salt does to meat. It makes the proteins in the chops relax – which translates to a more moist product. This pork recipe for kids just got more fun! Brine for at least 1/2 hour. Make sure to use a container with a tight fitting cover. You don’t want all the raw juice over your fridge. Been there, done that, don’t do it. 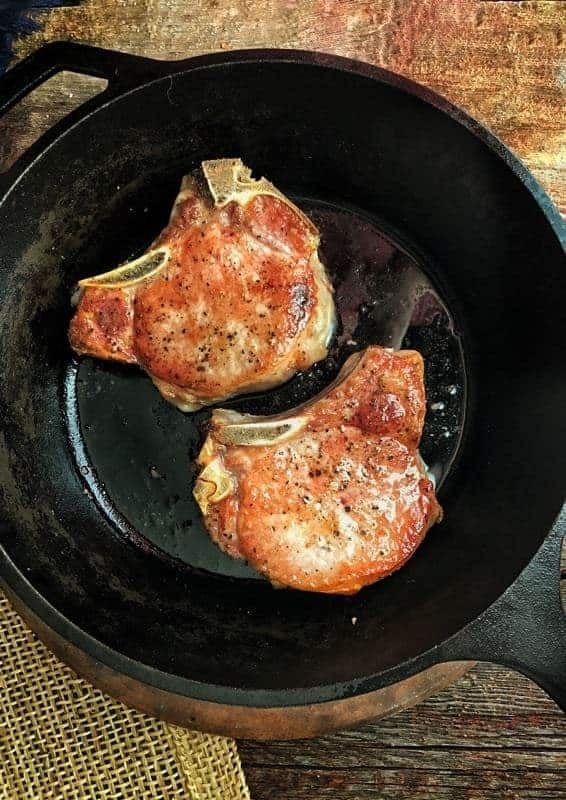 Perfect pork chops, every time! 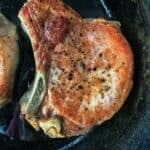 You are a few simple steps away from delicious pork chops that will quickly become a family favorite. This recipe does require time to brine the pork chops before cooking. 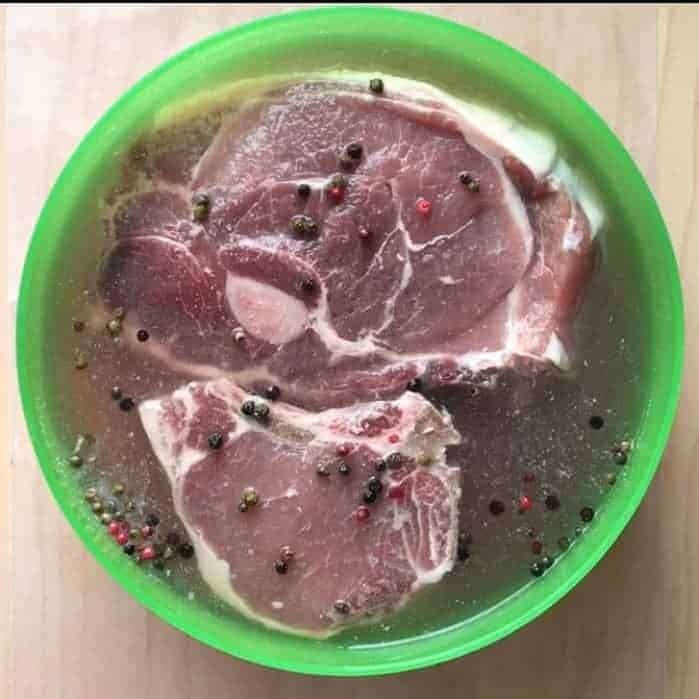 2 hours before dinner (or in the morning), place pork chops into a deep bowl with lid. Mix 3 tablespoons salt into 1 cup hot water, stirring to dissolve. Add peppercorns. Pour salt solution plus another 2 cups water over chops. Add more water if needed to fully cover pork chops. Cover and refrigerate for at least 1/2 hour. Place oven-safe skillet into preheated oven. 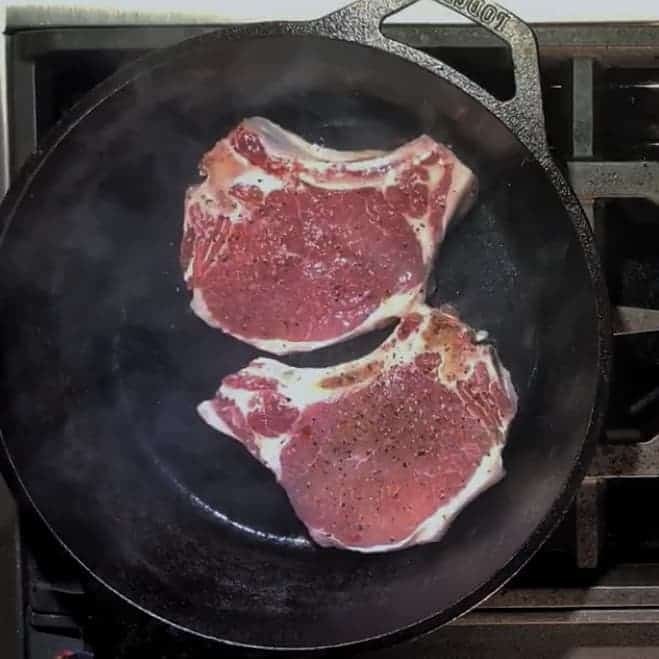 Make sure to heat enough skillets for chops to all fit flat. Remove chops from brine solution, pat dry. 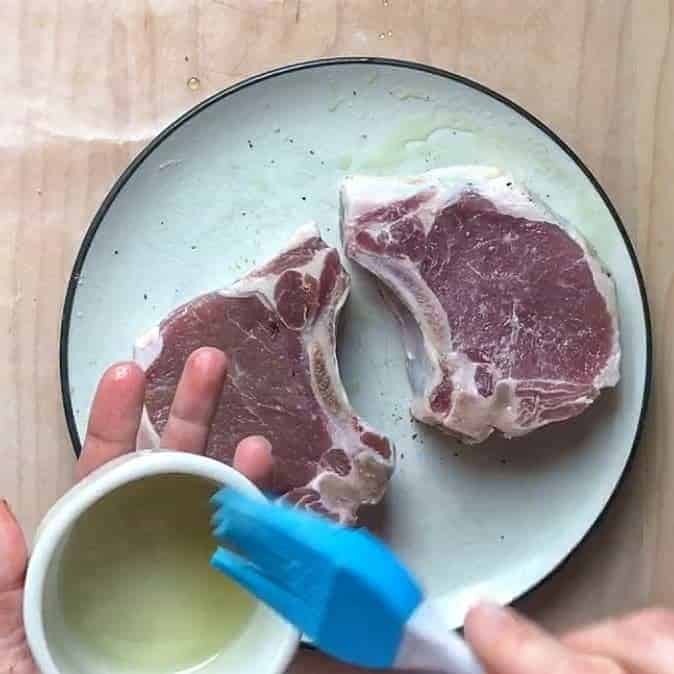 Using a silicone pastry brush, brush chops with olive oil on both sides. Using oven mitts, remove skillets, place over high heat. Place chops into the hot pan(s), searing. Don’t poke or flip until chop releases itself from pan, about 3 minutes. It should be golden brown. Flip pork chops using tongs, immediately place in hot oven. Cook about 6 minutes or until internal temperature reads 140- 145 degrees in the largest part of the chop. Don’t overcook! 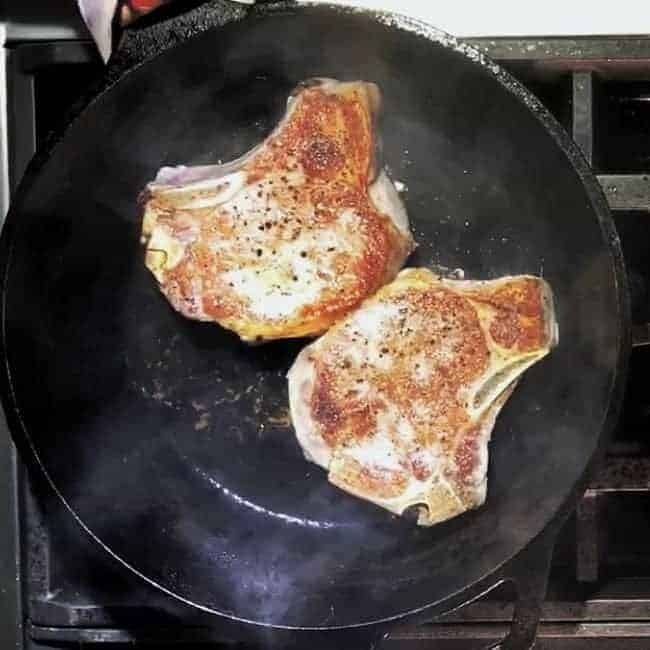 Let chops rest 5-10 minutes before serving. Note: The pork will look pink in the center, it is fully cooked at 145 degrees. Click to check out Penzeys Peppercorns. For side dish options make sure to check these out. You are welcome Melanie – I am glad as well 🙂 I think the brine makes a huge difference, give it a shot! Thank you for that great recipe!!! I can’t wait to make it. I’m sure my husband will love it. I’d love to hear how it goes for you Jessi! Best pork chops ever! Thank you for the tips!